The NHL, like every other sporting organization, hands out stiff fines for criticizing the on-ice work of their officials. To suggest that the refs are incompetent or blatantly in favor of the other team is a serious accusation that calls into question the entire fairness and level playing field of the sport. Those who venture to question the league and it's referees on these issues rightly see their bank account suffer as a result. Barry Trotz essentially did exactly this before Game 3 with his suggestions that the league was favoring the Pittsburgh Penguins by suspending Brooks Orpik for 3 games. His comments were moronic, as were his previous comments trying to defend the hit. Orpik's hit was far and away later than the league's allowable 0.5 second acceptable standard, he was veering away from the play to hit Maatta, he caught him in the head, and Maatta is now seriously injured. It was a situation handed to the league office on a silver platter, and not even a much maligned Department of Player Safety could mess up that one. Trotz was likely angling for a more desirable officiating outcome when he made that statement, but now the NHL is in a position to be setting a dangerous standard after Kris Letang caught Marcus Johansson with a late hit in the 1st period of Game 3. Fact of the matter is that Letang's hit is not one that rises to the level of what the league has deemed worthy of a suspension from postseason action, and to suspend him now would mean that they're validating the reasoning behind Barry Trotz making the comments that he did. To suggest that the referees are biased against your team comes with swift and immediate punishment - how does the NHL reward a team for making those same accusations a team making those accusations at the league level? They threaten to open the door to all sorts of allegations if they allow their decision making to be affected by the idiocy of a blowhard coach. Because based on everything the league has done up to this point, there is no possible way they can justify suspending Kris Letang for any amount of time, and the attempts to compare the hit to Orpik's just highlight the stark difference between the plays. Letang was stepping up on a player in traffic - Orpik chased after a player veering away from the play. Both hits were late, but Letang was judged to be 0.63 seconds after Johansson passed the puck, or just barely outside of the league's acceptable window. He kept his elbow down and caught Johansson in the chest, and in possibly the strongest factor in deciding discipline, Johansson returned to play the final two periods. That Washington is holding him out of practice today is either a blatant and transparent attempt at further influencing the league's decision making at best, or an admission that their medical staff irresponsibly allowed an injured player back into the game. When Dennis Wideman cross-checked the referee after taking a huge hit and remaining in the game, the NHL took extraordinary measures to ensure that their system of addressing head injuries wasn't called into question. They certainly won't do anything different in this case. 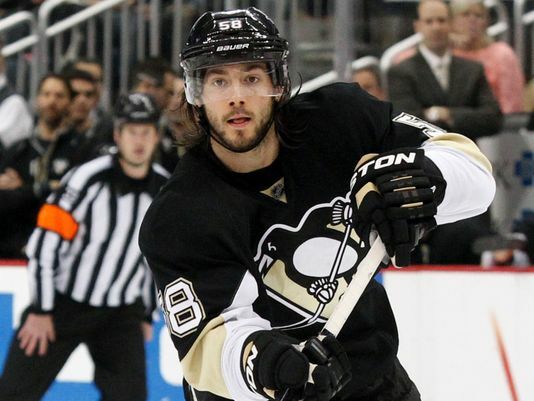 Kris Letang will have a hearing on his hit, and Kris Letang deserves a fine given that the hit was delivered outside the league's acceptable window. But any further calls for discipline are horribly misguided based on the NHL's postseason track record. The NHL has not suspended players for delivering otherwise legal body checks marginally late, and it'd be a horrible and dangerous precedent for them to set to do so in this case after the clear attempts by the Washington franchise to influence their decision making. They need to ignore the Capital manipulations and stand strong by applying the same justice to Letang as they have in the past - no suspension. this was a "clean" hit a month ago. Caps, fans and their announcers praised it. No suspension or fine.